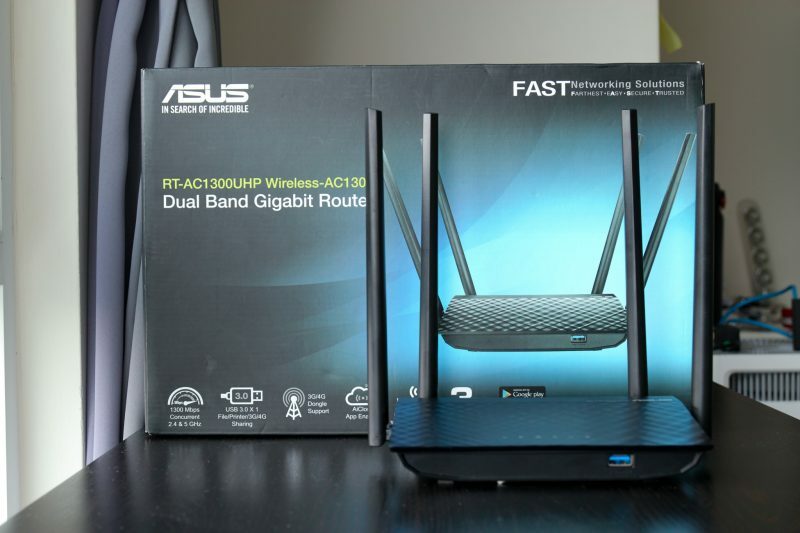 Asus RT-AC1300UHP Wireless Router Review – Asus best mid range router? 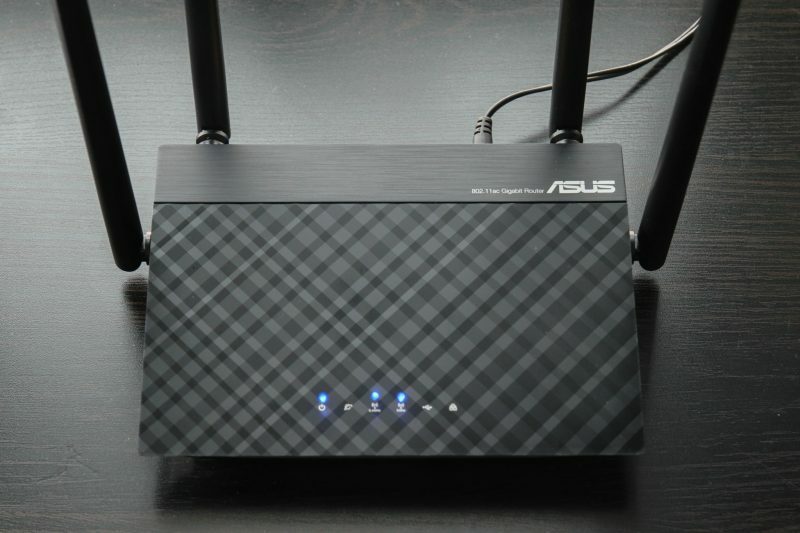 Asus RT-AC1300UHP is the latest addition to Asus mid range Wireless AC router lineup. 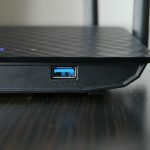 This is the range of routers where most people will buy due to the price is more affordable and they offer a good value for the price of the router. It comes with the latest specifications and we shall see how it stacks up against Asus RT-AC55UHP and the RT-AC1200G+ which is priced in the same range as well. You will be surprised by the result! On first look, I like the design of this router. The design is plain and simple with a matte black look. I am actually surprised by how small this router is, the footprint is actually just around 18cm*13cm. You are able to put this router everywhere with the small footprint. 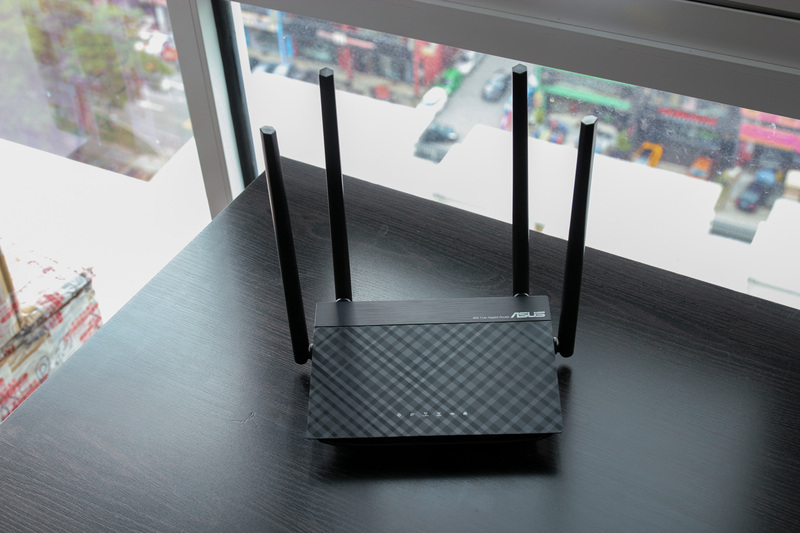 The built quality is still Asus standard, quality matte black plastic material is used all around the router despite being a mid-range router. Asus RT-AC1300UHP have support for Wireless AC1300 (400Mbps on 2.4Ghz and 867Mbps on 5Ghz) with Wireless MU-MIMO Wave 2 support. I believe this is the most affordable MU-MIMO wireless router in the market currently. On the more technical side of things, it runs Qualcomm IPQ4018 Quad Core SoC. This means the performance of this router should surpass Asus RT-AC55UHP and definitely better than RT-AC1200G+. The specifications of this mid range router is pretty impressive and we shall see how the specs convert into actual real world performance in further testing. There are 4 antennas on this router which they are non-removable. Asus claim that they are high gain antennas so you shouldn’t need to replace them. I also like the fact that there is a mechanism to ensure the antenna stay upright for the best signal coverage. The router comes with 6 LED indicators on top of the router. There is not a lot of things going on at the back of the router. You get a handful of 4 Gigabit Ethernet LAN ports and a WAN port at the back of the router. The single USB 3.0 port is situated at the front of the router. 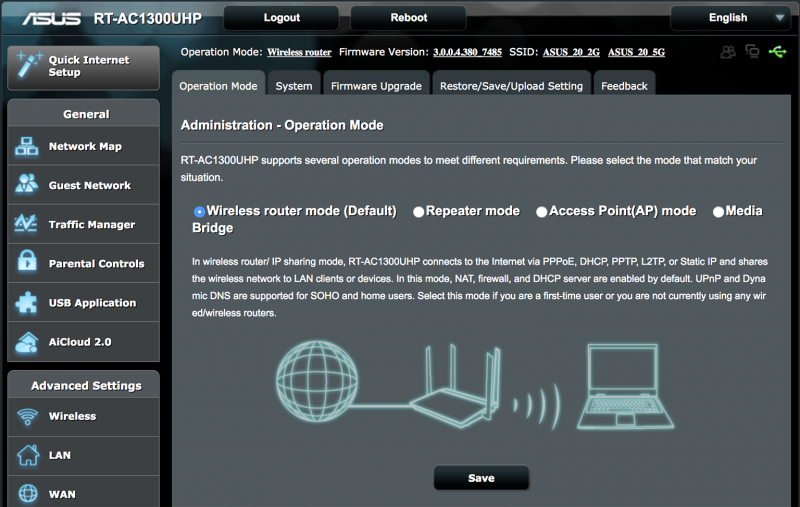 Asus RT-AC1300UHP comes with the familiar AsusWRT firmware. You have the familiar AsusWRT interface which I have always liked for the features and stability. The main page allows you to have a good overview of your network. Of course, you also can use the Asus Router app which is available for both Android and iOS devices to manage your router. Setting up this router is really user friendly as well. There is certainly no lack of features on this router. It comes with a basic QoS mechanism which Asus call is SmartQoS. 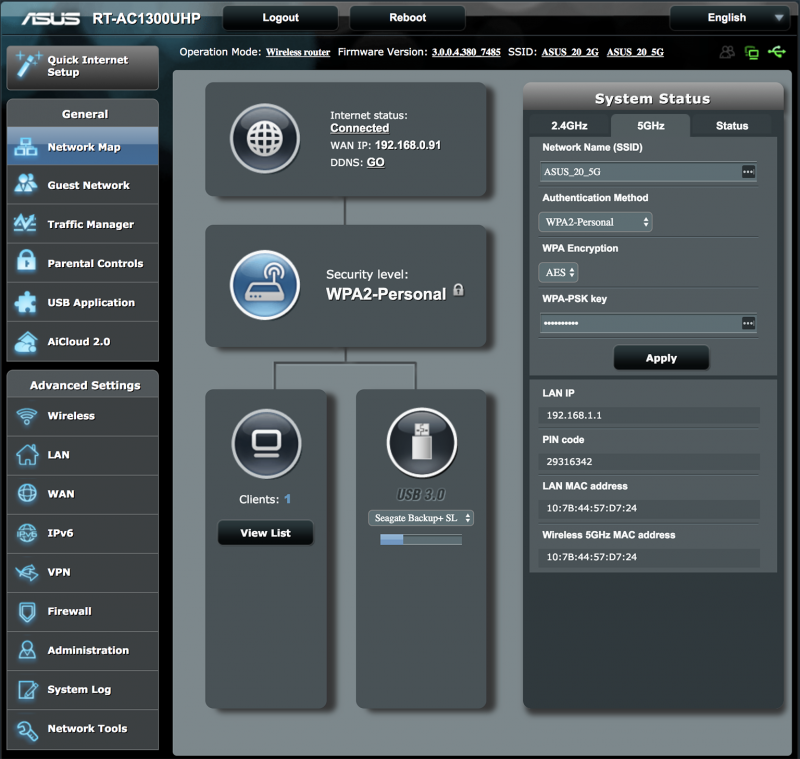 It also comes with a VPN server and VPN client in the firmware. This is useful if you use a VPN network for your entire home. There’s also a basic parental control feature in this router. I really like the flexibility of this router which is able to function as different roles. Apart from the usual wireless router, access point and media bridge operation modes, it is able to function as a wireless repeater or Asus calls it range extender. 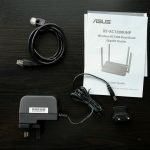 You can use it to expand the signal of your existing network of your Asus but that will be a really expensive despite really good wireless repeater. You can do a lot of things with the USB port. The router have support for USB 4G/3G modem so you can plug it a USB 4G modem for internet connectivity on this router. Besides, you are able to plug in a USB drive and share files on the network easily to all devices. You also can plug in your USB printer and transform it into a network capable printer easily. 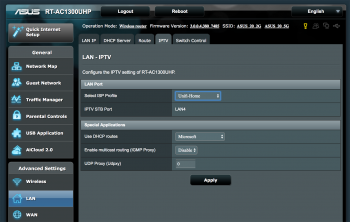 The router is fully compatible with TM Unifi with HyppTV working properly. It is compatible with major Malaysia ISP as well. 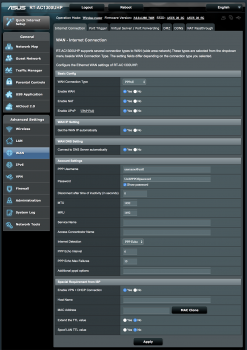 You can refer to my Asus Unifi router setup guide on how to configure this router to work with TM Unifi. You can either use the quick setup guide or just head over to the LAN > IPTV page and change it to the Unifi-Home profile then proceed to key in your Unifi PPPOE ID and password obtained from TM. We know the RT-AC1300UHP comes with decent specs for the price of a mid-range router and we shall see how it translates into real world performance. Wireless signal strength is great, I think it is slightly better than Asus RT-AC55UHP. It is definitely better than TM stock D-Link DIR-850L router. The wireless performance is decent as well. As expected, there is no problems with my 100Mbps Internet connection. With the quad core SoC and 256MB RAM, there shouldn’t be an issue to handle a large amount of connections. I have over 15 devices connected and this router is not showing any signs of congestion. My wireless benchmark testing methodology is slightly different this time. I am using my Samsung Galaxy S7 Edge as the client due to small devices are more relevant nowadays, performance matter more on small wireless devices with smaller antennas. This is partly also due to I do not have another computer to act as the iPerf server. Well, back to the figures, I am impressed. The RT-AC1300UHP is able to deliver over 400Mbit/s consistently over wireless to my phone. The beamforming is doing its thing to increase the gain to the wireless client. It is much faster than Asus RT-AC55UHP and RT-AC1200G+. There is a single USB 3.0 Port in front of the router. I insert my usual USB 3.0 External hard drive to conduct a simple network file sharing speed benchmark over Samba. The performance is surprisingly good for a midrange router at around 18MB/s for the read and write speed. The quad core SoC is truly showing its power here. The performance can easily beat higher end routers. Asus RT-AC1300UHP is currently retailing at around RM550 in Malaysia. I believe this is the most affordable MU-MIMO Wave 2 wireless router in the market currently. The value of this router is really good. It comes with a decent specification to ensure that this router is able to handle a large amount of connections. The quad core SoC and the huge amount of RAM is doing its job in ensuring that the router is never bog down. Not to mention that the stability is great as well, I have this router on for days and all my wireless devices are connected without downtime. 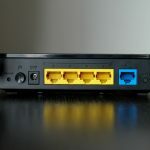 Coupled with AsusWRT firmware which is known for its simplicity and stability, it is really easy to configure and maintain this router as well. I recommend this router to be a replacement of your stock router provided by your ISP. At around RM550, it remains relatively affordable to most people but it offers a great amount of value. Sure, it may not have those fancy features that are reserved for the pricier Asus router. But, how many features you need on a router? It is possibly my new favourite router from Asus. Does it able to cover till top floor for a 3 storey house? Currently using a rt-ac14uhp,am looking to replace it.staying in a 2 storey landed,is the rt-ac1300uhp alone or rt-ac68u paired to lyra trio on aimesh a better choice. Get a single unit of RT-AC86U. Hi, I would like to replace dlink 850l with this router. What my concern is how much will the asus ac1300uhp wifi signal strength better than the drink 850l if I stay next door. The RT-AC1300UHP signal is definitely better. Maybe you can consider adding range extender to the network. Hi, just want to update some results. I changed the Dlink 850l to asus ac1300uhp and the results were surprising. I only able to get 30++ ping and 25++ Mbps download speed with dlink. But now, my download speed boosted to 75++Mbps and with 7 ping only. I bought this router to replace my broken Asus RT-AC55UHP. I am very satisfied with it. Thanks for your review!